Grass. Knocks one line straight to your head and that is “the grass is always greener on the other side of the fence”, isn’t it? The number of times I have heard this line in my childhood, I haven’t used it as much, and I am grateful for that. Coming back, artificial grass (now we are here to review the best artificial grass). Yes, they are a thing now, and I am pretty sure you have seen one if you couldn’t realize it then. Because back then, they were more like green doormats and nowhere near what we all grass. Ah, grass! Another thing I can relate to this word is the surreal feeling of walking on it, barefoot. The visuals of dewdrops on grass blades, a very consuete picture associated with grass. But sitting? Have you ever tried sitting on grass? I absolutely hate the feeling because every time I did, had a bug sting, had the blades poke, saw ants getting on me, smelled things I didn’t want to; the list goes on. Today I will introduce to you from myself, the type of grass I can actually sit on, without any of the troubles mentioned above. Not a very big fan of all things fake (if you don’t know what I mean, you don’t know what I mean and be glad), but a big fan of silky smooth grass that’s fake. Yeah, I am talking about the best artificial grass rugs and what’s best for you. A complete buying guide and almost everything you need to know about artificial grass, here you go. Artificial grass or better known as artificial turfs are, simply put, a surface that has synthetic fibers replicated like natural grass. You can see them frequently in sports arenas, of course, for sports that are played on grass. Nearby a swimming pool, for example, you wouldn’t find one of these. I’m talking football, golf, and the likes. But no, not basketball, no. Oh you know, the sports that were originally played on grass, those can have these as a replacement of the grass. Not just sports, these turfs are even used in residential lawns, not to mention commercial spaces. Artificial grass caught the attention first back in the 1960s. To be exact, 52 years ago in 1966, in Astrodome. Well if you don’t know, Astrodome or the Houston Astrodome is the world’s first multi-purpose, domed stadium and the first major sports venue to have installed artificial grass. A team of the Research Triangle Park researchers headed by David Chany, Dean of the then North Carolina State University College of Textiles, created the first artificial grass. Thanks to Mr. David, indoor major league baseballs and welcome mats became a thing. But it was first used in a Rhode Island school in 1964. It gained publicity after the specific artificial grass, then known as ChemGrass, was later rebranded as AstroTurf, for Astrodome. Now why “Turf”, why not “AstroGrass” (ew, sounds disgusting. Maybe that’s why they weren’t named so). The “Turf” is AstroTurf comes from the process of forcing synthetic filaments into the base and sealing them with flexible adhesives. The story behind its usage goes such that the avant-garde stadium chose to use normal, natural grass for their first season in 1965, but all the grass died, as grasses do, due to the lack of any natural sunlight and water, and they were painted green so as to last, toward the second half of the season. This major mishap leads to the use of Astroturfs. This became like a generic trademark everytime artificial grass came up in conversation, until the last century. From there Astroturf and similar artificial grass surfaces were used in Canada in the 70s. And this brings us to the second and third generation artificial grass mats that have evolved past the basic Astroturf, with the elementary synthetic fibers being replaced by longer fibers and sand infills, which in turn was replaced by the modern “rubber crumbs”( about which I will tell you later). A good artificial grass mat will need even better blades. Although it differs from countries to countries, or more specifically, from companies to companies, which material goes into the grass making, it is generally made of a combination of polypropylene, polyethylene, and nylon. And you know, there isn’t a fixed combination. If you want the best artificial grass for your pets, you might want one that tackles absorption and if you want one for your sports academy, you might want one that can deal with all the ruggedness, and is notably durable. The backing material should be rough. It can be made of plastic or polyester. The polyester tire cord is used for the artificial grass designed for sportsmen since they have the greatest quality and heat retention capability, that is very much required for the athletes. If there were no filling, the artificial grass mat would probably look like a two-dimensional comb. Can you imagine? Just fibers standing on a base. The filling is what gives them the brotherly harmony, keeping them close together. Polyester foam, or if required rubber materials make up the filling. While manufacturing, the necessary materials are blended and made to go through chemical processes to bring the grassy texture and color. This molten mixture is passed through an extruder to turn them into dry strands, which are then given a rope-like shape, woven into the carpet by a thousand or more needles, and then assembled. The final touch makes up the carpets. You know the ins and out of artificial till now, like literally. Now I should tell you why you need the best artificial grass for your home or any other place that you love next. Ever panicked why kids aren’t playing out anymore? We all do. They no longer wat a cut on the back of their hands, no slipping right into the mud. Even if the preschoolers don’t mind, the teens are especially indifferent to it. A game of FIFA on the PC, what say, champ? But no, seriously, These artificial grass will encourage them to go out in the lawn and play their heart out without getting the dirt on. Even in winters. Ever wondered why miss Emily in the next yard has a lawn that looks beautiful and mowed all the year round. Don’t envy, you! It’s just the artificial grass that you can have too. Modern artificial grass is light years apart from the one we used to see in the greengrocer displays. Not just an outpour of a shade of green, the new ones are a mixture of various shades of green and has thatches. Yes, thatches. What proves the beauty of life more than death, right? There’s a philosophy for you. And the blades and thatches aren’t just straight as a pin, but curly, wavy, to give them that naturalistic look. With no aerating, no dethatching, no mowing, no watering, what do you have to lose? 50% of the customers these days can lay the artificial grass themselves. There, installation costs bye-bye! You just have to make sure the seams are all in harmony. You can lay these over almost anything. Consider sand, earth, concrete, tiles even tarmac. Just the surface has to be even for better leveling and visuals. Fake lawns can last you decades. The only thing you will need to remember if you don’t want a carpet that has faded, change it after 10 years or 5, you’ll know when to do that. This is a good deal for the smaller ones. A fake grass will cost you no fertilizer, no water consumption, lesser electricity usage etc. And newer ones are in the development which will be able to be recycled and will be made up of eco-friendly materials. Table display, photo backdrop, lawn, litter box, yard, garden, patio, porch, sports fields, door front (as a doormat), kindergarten, amusement parks, deck, picnics, camping areas, showcase, balcony, terrace, pet feeding and what not. You can use them for so many reasons, I’d rather you buy one right now and wonder how you didn’t buy one yet. Oh, you can send them as gifts too! This rugby Ottomanson has a couple of functional features. It is stain-resistant, fade-resistant, non-slip and non-shedding. From what I have understood, it is perfect for patios and children in particular, as well as pets. You can use it to train your little ones walking and not hurting themselves, scraping their knees and toes. And you can also use it for your utility room with the cat litter boxes. That way it brightens up the room too. Also, if your patio is hot during summers, you can use it to cool that down. And no, the rug won’t melt. Also, you can cut it with regular scissors or razors to fit your room/space, the nooks and corners, and need. Here is a chance to use it as a runner, I hear. The only downside that it is too thin for some, while others have said it isn’t as thin and serves the purpose just right. Passing along, it is 1 and a half inch thick weighs 3.8 pounds, has a dimension of 5.1 x 6.4 x 31.9 inches and is made using nylon. And it comes rolled up like a rug, not just folded, as would be a matter of complaint. this green artificial grass has a very mild texture to it and is pretty cheap. It isn’t soft as a feather, but it is comfortable enough. Available in 7 different sizes, this one from Zen Garden is the boss of artificial grassing your indoors and outdoors. This is singularly heavier than the ones you would get at a similar price and of better quality than them. The 4-toned colors in the grass blades, modeled according to the real grass, give their grass a realistic look. The blades are 1.7’ and it doesn’t require added filling for a fuller look; the mat is dense in itself. Drainage holes, weather resistance, rubber-backing, lead-free built, premium synthetic fiber, you name it, they have it all. Wait, did I mention it is pet-safe? Well, yes it is. All that at such an affordable price. Dark and light shades of green adorn the piece. And the dark too isn’t too fake. And the backing material is such that it doesn’t carry sand or dirt with it, making it easier to install elsewhere. If you have a problem with the thickness, then you can buy a sample piece and try it out. Just buy it if you hate wasting water all in all behind something that isn’t paying off, so as to mean the natural grass lawn that you have. 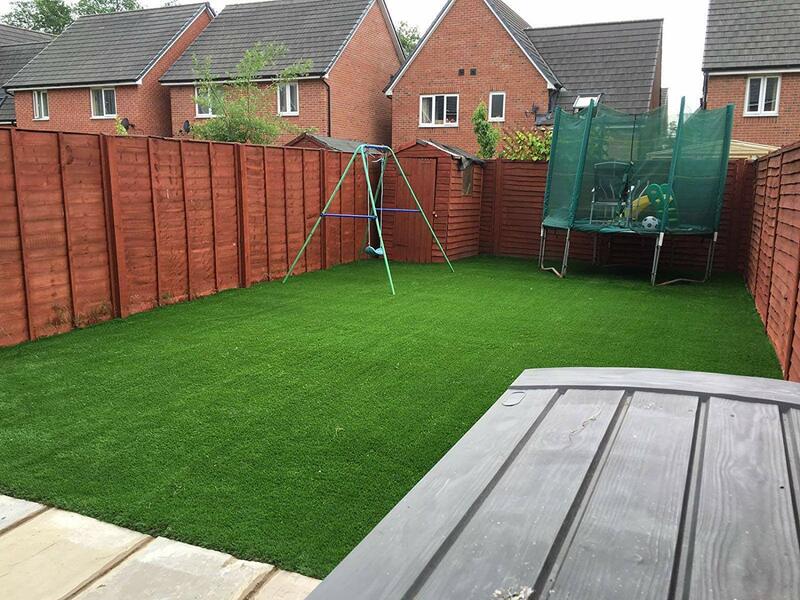 What’s more, this sure is the artificial grass for your dog, but make sure it is installed properly because you don’t want your dog to tear off the seams, which is quite possible if you don’t do it properly. Artificial grass patch also won’t get hot. Come on now, lay your hands on this masterpiece (if I daresay). Their rug is made of lightweight material and has a marine backing. It is great for pool areas, boats, and other wet areas, also for any special events. UV-resistance and fade-resistance are also two of their special features. It weighs 7 pounds and has a product dimension of 68*96*0.2 inches. You might even start to feel like there is an extension of the garden in your balcony, the color is so naturalistic. Outdoor turf rug can make the deck look actually very relaxing and playful with its vibrancy. Also, put them beside your pool areas, and the tough cement wouldn’t be as hot to walk on. The maintenance is also very cheap, you will just have to hose it off and let it dry. This cheap artificial turf would be the best (I promise). And it dries easily, too! If there’s one downside to it, it would be the weight. Now you might be thinking I am mad, because the fact that it is lightweight may attract some of you into buying it. But, I am saying it for those with dogs, and let me correct myself, big dogs. They might tear it off if they are on the rowdy side of the spectrum. So, you better take it to the ground. This is another one: Click here to see the latest price on Amazon. This cheap artificial grass rug from Ottoman is made using 100% eco-friendly, recyclable material and it is durable too. It weighs 3 pounds and has a product dimension of 20*59*1.2 inches. Naturalistic in look, it is great for kindergarten, picnics, amusement parks etc. You can cut it to desire without the fear of fraying the edges. The manufacturer guarantees a full refund if you are not satisfied with their rug. You do not have much to lose if you invest in this. If you like it, keep it. If not, simply return. From the users of this rug, everyone is more or slightly less satisfied with the purchase. It is soft (approved by pets and children), looks fairly real, drains well, and dries quickly, no shriveling, no shedding, plus it does great in the sun. And it might get a teeny bit warm, but never hot. You should be thinking more patios, picnics, camping, and places like that with this one because this turf rug is intended for outdoor use only. The edges are all hemmed, no worries there. Grommeted corners of the rug ensure better stake-down. And the stakes are pretty low profile, so they don’t stand out from the grass crowd. 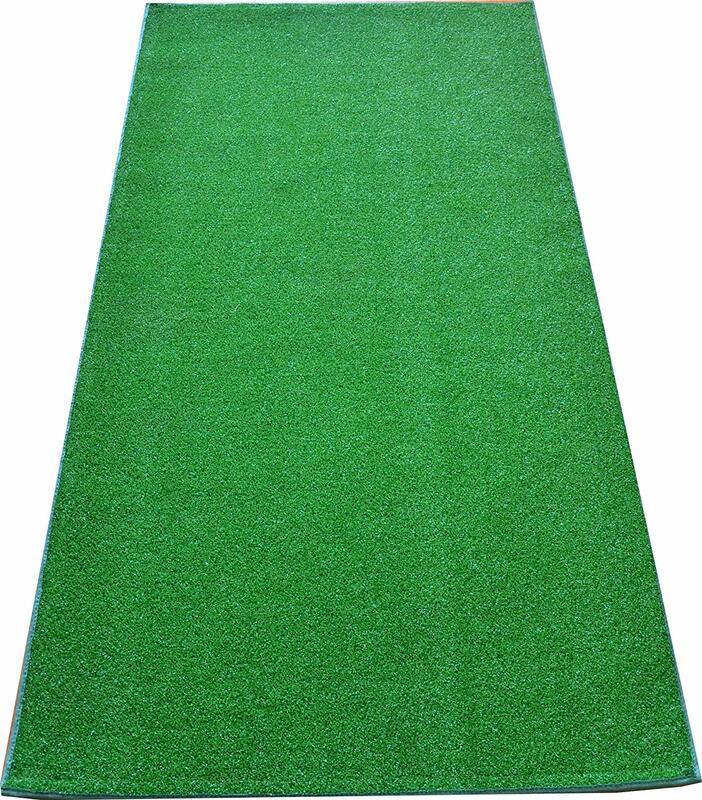 This cheap artificial turf is lightweight and a the same time durable. It can resist the harmful UV rays and can withstand the weather. Some of its users claim it’s too thin for them, which is, ¼”, but to others it is okay. However, it glistens and has a shine to it which people might not prefer. But then again. It’s for outdoors. A great value for money, this pet turf is lush, soft and safe, just the way you love it. The blades on the grass patch are fescue-like and look similar to natural grass. The high-grade polyethylene and polypropylene yarn make it weather and pee-resistant. It doesn’t need staking. But that doesn’t make it is any less durable. The rubber back allows it to stay in place even without the help of all those, and you can place it on wood, ceramics, cement, soil, anything you want. And it weighs 56 oz per square yard. Heavier than it’s generic members at the same price. A blend of aesthetics and utility, this is a great buy. Take good notice of the dimensions when buying the product, not to make your lawn look like patchwork. Pet lover? 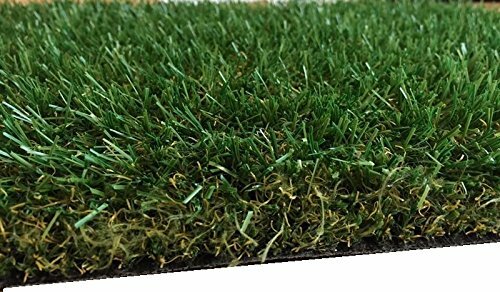 the good news is that this cheap artificial grass is helpful for your dog if you search the ‘fake grass for dogs’, here it is! Green striped design and a close-cut pile, the rug has a freshly cut look to it. It is 10 mm in height and has thick weaves. You can use it for your indoors or outdoors, whichever you prefer. Plus, if you give specifications to them, the manufacturers will shape it as you want it. A touch of green is always relaxing and don’t be startled if your piece becomes a “conversation starter” as they say. The size of the rug is 4*6 feet and it has a rather shallow pile. You can clean it easily with a hose. One thing to remind, if you are planning to use it for children to play soccer on, be sure to add padding. Since it has none, if they fall, they might get injured. You can also use it as a potty spot for your puppies to train them or under swings. You know the thing with grass under the swings how children kick it off while swinging, right? Well here’s the solution! The rug will blend well with the rest of the garden, and stay put. Also, it will be a good piece of decoration in the football seasons. Although some have claimed they can see light passing through the thing, so thin it is, others are quite satisfied. At the end of the day, it comes down to your preferences with the size. Overall, a manageable buy. The best thing about buying from them, Tuda Grass Direct, is that they provide free samples. Therefore, you can do your research and test it out to see if it is the one for you. It has a latex backing, with drainage holes in it and doesn’t require sand filling. They promise that their product will not fade in the sun, having “fantastic UV protection”. Their grass also is sourced from the Netherlands and Belgium, claiming state-of-the-art quality and durability. Children and pets are also safe with this piece right here. Looks so realistic, you’ll wonder why you didn’t order a bigger piece. 4*6 feet in size, it weighs a little over than 3 pounds. There is no hassle of cleaning, maintaining and watering with the artificial grass rug here. Now I am not claiming this is the most realistic grass rug you could pay for. But you are actually getting what you are paying for. Meaning that it is thin enough, green enough, and modest enough to amp up your balcony or as a pooping spot or resting spot for your pets, but it will not be the center of attraction in the balcony, neither will it look lush and thick like a real lawn. To give another example, instead of seeing a well-cultivated balcony/backyard, your neighbors will see a green one, which is better than the cement-metal/deserted land. It isn’t incredible, but is basic and yet tolerable, and can meet smaller needs. Want to create wonderful window displays? Here’s a safe bet from Buzz. Not too fancy, not too pricey this piece is great if you want to use as a kindergarten backdrop, greengrocer display, stall decoration etc. It is 6*3 feet and is as plain as plain can be. And you can’t complain if you have the grasses shred, or if the backing black material shows because honestly, it is for simple purposes. Decor and beautification, not so much. But you can use it for pets. This is my second favorite artificial grass rug, although it compromises realisticity. The interlocking is troublesome if you ask me. And some of the unhappy customers said that the cut edges that are supposed to snap together have bits of extra plastics on the edge of the smaller ones that make it harder to put it into the other ones. And I’m talking 16/24 of these for six pieces, and that calls for a headache. But the end result is worth it. The top quality grass deck lines are durable, low maintenance, is soft and thick, best for kids and pets. They are also anti-bacterial, flame retardant and environment safe. Besides putting it for dogs or in the babies’ room, you can put it in areas where grass doesn’t usually grow for the shade and have a great bargain for the price to decorate. 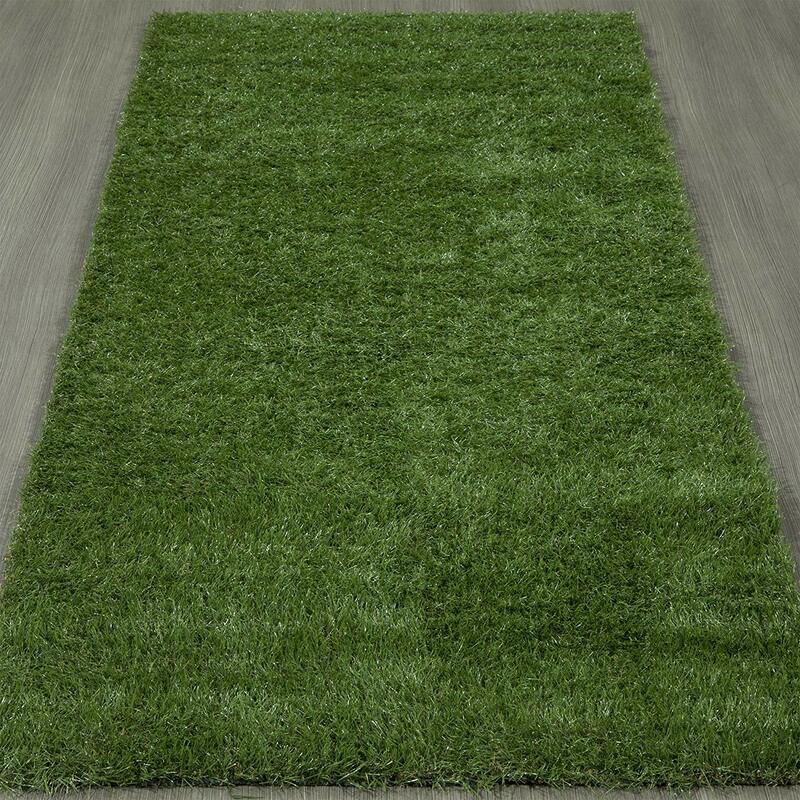 This non-toxic fake grass rug is made from synthetic material. It has a 4 tone pattern, which means a more naturalistic look for you. The pile height is taller than what you would find usually. The blades are well manicured. The back has durable rubber as the material and is with drainage holes in it. Also, it uses a specially manufactured spine yarn to ensure the thickness of the grass. What’s good is that it comes with a warranty of 14 years. Cleaning is also instructed every three months, to keep it looking good as new. The lab test for fire resistance, color degradation, and durability also gives it an edge from its other competitors. 70 0z. Is the total weight pressure per square yard, so while placing in on your balcony or terrace, it is advised you are aware of the weight bearing capacity. For outdoors, it’ll be just fine. It can add a delicate and beautiful touch of greenery to any barren land, right after installation. However, they do not customize for the clients, so you’re gonna have to do it yourselves. This cheap artificial turf rug is made from 100% polypropylene and is perfect for pets. While it does drain, it does hold water too, in some of the places and it takes a couple hours for it to dry up. And another thing is that it doesn’t do quite as well in the winds if you haven’t staked it down. It might fly away if you don’t put something on it, otherwise, it is very durable. And the grass doesn’t burn your feet on walking, it is softer to tread. And if you have a speedy dog that loves to chase (and pee) it is still a good buy and won’t give in. Free samples with TDR, yay! The water-resistant rug has a latex back cover and is easy to shape. Both the children and the pets are safe in the hands (or should I say lap) of the rug. This is UV stabilized. So this along with the introductory feature make it look stunning all year round. To clean it hosing or down pouring will do the job for you. The highest quality European manufacturing ensures functionality that will only please you. This is tougher than carpet or vinyl but has the softness to it due to the synthetic fibers’ built and you couldn’t be happier with it. A very warm green and a great value for money, you can try your luck on this one. Will add an instant zing, I assure you! The Astro Garden lawn that you can build with the Luxury fake grass rug from Tuda Direct comes to you with their special offer, that is you can ask for free samples before deciding whether or not you want to buy from them. Their rugs are UV-protected, fire and heat resistant, won’t fade color and is safe for pets and kids alike. You can use them for your indoors as well as outside your house. No more cleaning muddy little footprints off your white tiles with this budget-friendly, worthy investment. This is especially known to the artificial grass lovers for home, owing to the name that is “Luxury” and stands up to it in use and appearance. I would highly recommend it to you for its look, foundation, cleaning ease, I could just go on, you know. You can use the sample and I daresay you will indulge in its usage and lay it anywhere you want to add a dash of natural green. There is a good amount of money involved here. For an artificial lawn, nearing 1000 sq feet, you’re going to have to pay $20K, considering the range of $15-$20 per square feet. But if you are planning to buy them for your pets or balcony, cheaper for you. The maintenance is low, not a no. If you are setting them up for your backyard and you have trees nearby, fallen old leaves and since trees, hence birds, you will also have to clean up residues to be polite. If you are setting them up for your balcony or for indoors, you’re still gonna have to rake the grass to keep things real. 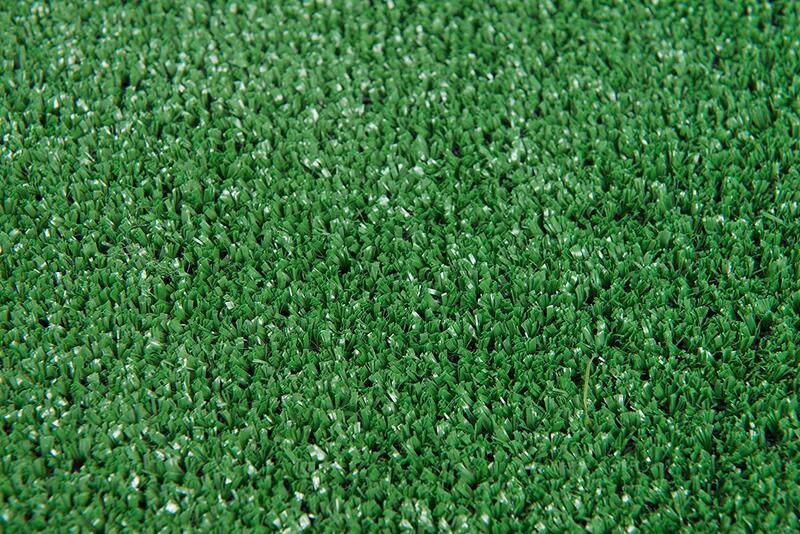 There’s an article on Turf Wars featuring the use of rubber crumbs to make artificial grass. The debate continues and I am very much assured of the health risks associated with the use of these. So, always prefer grass carpets with ceramic coated sand or the likes for safety. Be sure as to not have your turf melted by the reflection of the sun from your south windows. God forbid the smell of melted synthetic grass. This is not what the manufacturers will help you in, but you will have to sort it out yourselves. You need to arrange for a drainage system underneath your backyard because you would not want water to sit in it for long. Also for those of us who have pets, watch out for little Tommy’s pee, and find the carpet that suits better. And that brings me to the end of my convincing. If you have read this far, you now know how essential and helpful it can be to use artificial lawns. If you haven’t read the whole thing, let me tell you again. I have one at home; take it from me. The best artificial grass rugs add beauty, look and feel excellent, children love it (I don’t have pets except for birds so couldn’t tell for dogs, sorry), my mom loves it and everyone keeps asking where we got it from. And if you want you can check my reasons again to decide why to buy them, and if you don’t enjoy reading much, to be honest, and to say it quick, just get it for the aesthetics, man. It’s worth it. Don’t forget to read the prerequisites of buying, though, even if you are in a hurry. Here is an article about the ‘best fake flowers that look real‘ helps you to buy the best one for home decoration.